A lot went down this weekend. Get ready for an MTV Movie Awards recap, Coachella FOMO and more. 1. Host Amy Schumer killed it. We can’t help but wonder how her baby from Secret Life of the American Teenager is doing. And how someone from Secret Life of the American Teenager is still on our TV. 3. Kevin Hart won the Comedic Genius Award and I think we’re only one year away from his daughter being taller than him. 4. Zac Efron looked hotter than ever, but hi costar’s hair looked like mine after I don’t shower for 4 days and try to pull off a ponytail. But they were really there to give Robert Downey Jr the Generation Award. RDJ told the audience to “define your generation.” So I guess that means I should aim to be a selfie-obsessed, too-lazy-to-take-my-hair-out-of-a-messy-bun complainer, and find my husband on Tinder. 6. Channing Tatum made us forget how bad Magic Mike was and consider seeing Magic Mike XXL. 7. Fat Amy channeled her inner VS Angel AKA gave us the gif we can’t wait to use for next year’s fashion show. She also gave us an exclusive look at Pitch Perfect 2, and the return on the riff off got us counting down the days until the movie hits theaters (#31Days #GetExcitedDad). 8. There were also a few performances that I don’t even know how to explain. Tinashe looked like she was doing a still drunk walk of shame. 10. Kendall’s BFF Gigi Hadid went #shoeless with her boyfriend Cody Simpson, and Cody unfortunately made #PonchoGate a thing. 11. 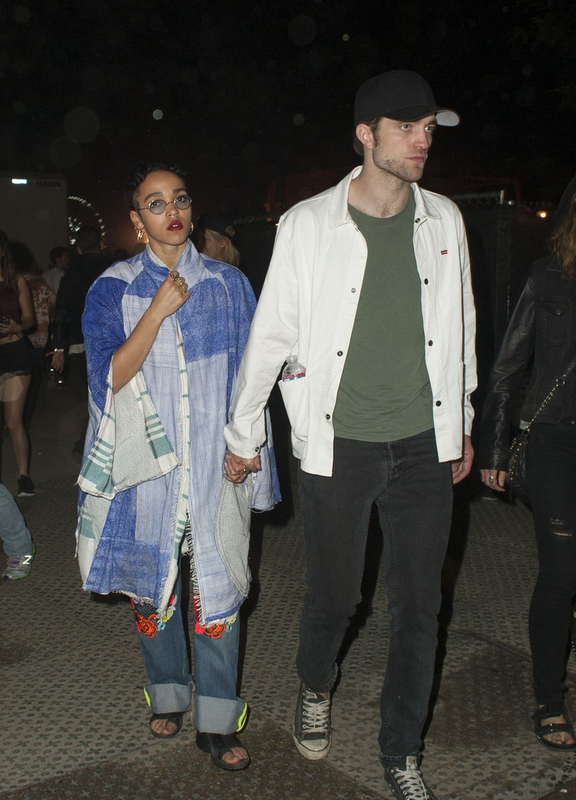 Another couple that hit the festival was newly engaged Robert Pattinson and FKA Twigs. The sad part about this photo is R Patz is the one who looked out of place, while FKA’s homeless look is totally normally at Coachella. 13. Speaking of cool moms, Meredith Grey’s mother (or former First Lady Sally Langston if you’re more of a Scandal girl) made her Coachella debut and looks like she pregamed with Meredith and some tequila. 14. Justin Bieber danced by himself and attempted to rock the saddest man-bun that ever was. 15. Rihanna continued her streak of wearing large, hideous fur coats reminding all of us that the majority of celebs are idiots. 16. Gwyneth Paltrow is pretending to be poor and living on $29 a week. I’m sure she’s sticking to it. 17. Chris Harrison is trading in “This is the final rose” for “Is that your final answer?” Yes, that’s right, The Bachelor host is going to host Who Wants To Be A Millionaire and have to manage an additional 4 fours in his vocabulary. 18. Baby news: Prince George made headlines for being super cute and looking in the china cabinet when Duchess Kate told him his dad was in China. 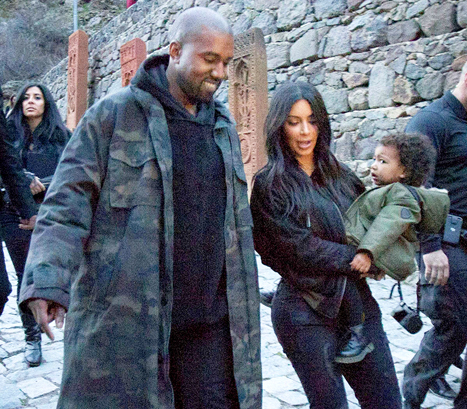 Meanwhile America’s own royal baby, North West, got baptized in Israel. Khloé was the godmother, so I’m sure her upbringing will be super religious. #Yeezus #KendallWearsCropTopsToChurch. In other baby dramz, Justin Timberlake and Mary from 7th Heaven welcomed a son and named him Silas Randall because why not name your kid something from The Vampire Diaries. 19. Hillary Clinton is running for President and I found out on an E Online alert. 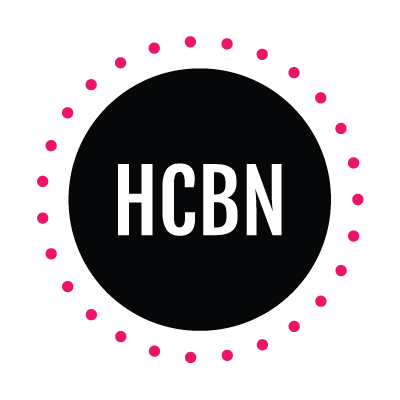 I didn’t know this was considered entertainment news, but then I remembered all of the potential memes and SNL skits to come. Amy Poehler, clear your schedule. 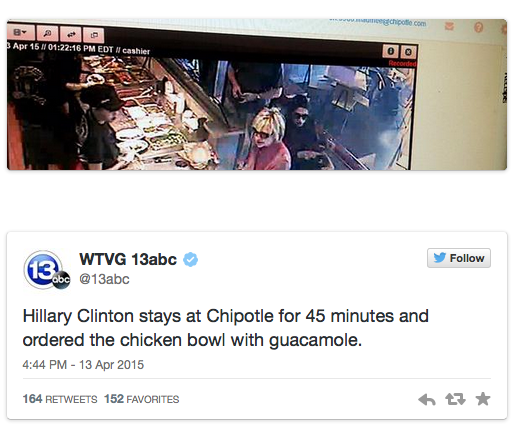 PS I’m think Hillary’s campaign poster should def be this picture of her ordering a chicken bowl at Chipotle.